In the era of comfort, convenience and luxury, everyone loves to work smart and not hard. Much of this can be attributed to the power of artificial intelligence-powered personal assistants that are making our life much simpler and smarter without breaking a sweat. Gartner predicts that by 2022, 80 percent of smartphones will be equipped with on-device AI capabilities, up from 10 percent right now. Artificial intelligence is not just limited to Siri or Alexa but it has gone far beyond you could have ever imagined. 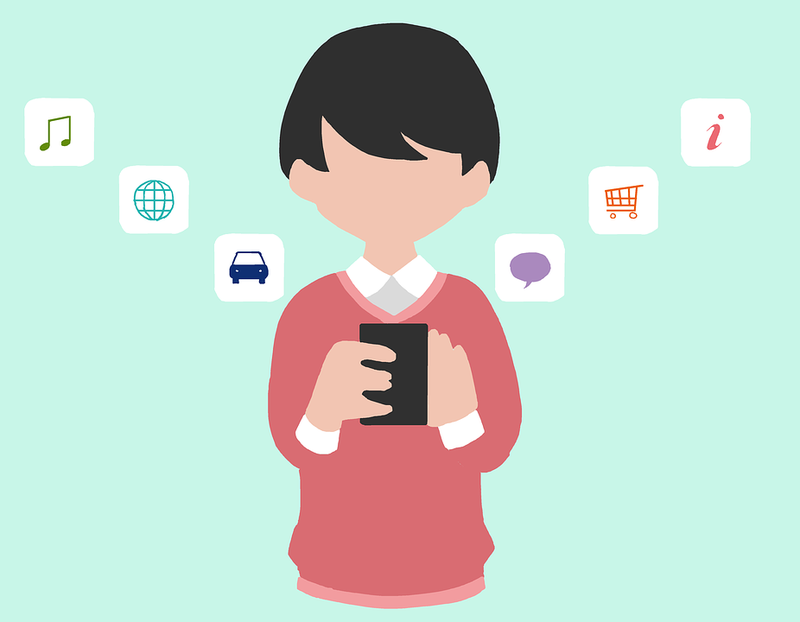 More and more smartphone users are using virtual assistant to enhance their mobile experience. Just by using your voice you can now ask your smartphone to compose and send text messages, read news or weather forecast for you. This app becomes your very own virtual assistant that helps you in managing your contacts, do-to lists and calendar. It directly connects to your Gmail, Facebook, LinkedIn, Evernote apps. 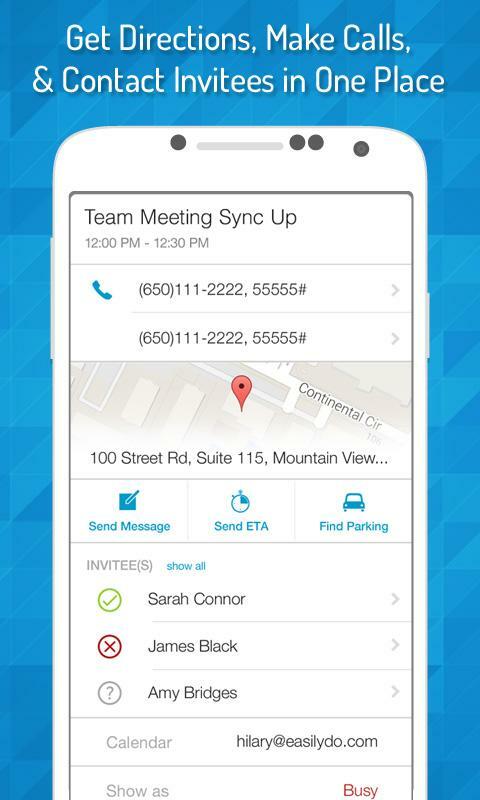 The app merges your duplicate contacts, checks traffic so you know when you can leave for a meeting, it identifies email you may have forgotten to respond to, reminds you of meetings committed to in email that are not on your calendar, adds flights to calendar and notifies you of delays or cancellations. EasilyDo automatically creates a digital boarding pass from an online check-in confirmation email in the EasilyDo feed. This virtual assistant helps you complete the action for any actionable email. It also gives you weather forecast for home or travel. It also sets a reminder for bills. You can also view top photos of the day or any photos that you are tagged on Instagram and Facebook. EasilyDo is available on both iOS and Android. Most of the features are free, but the access to full range starts at around $5 per month. Google Assistant allows you to quickly access your Google’s voice-controlled smart assistant with one tap. You can access your assistant by simply holding down your home button or by simply saying “OK Google”. It lets you do tasks like send messages, check appointments, send birthday cards and make calls hands free while you are on the move. It also helps you in taking selfies and play music. 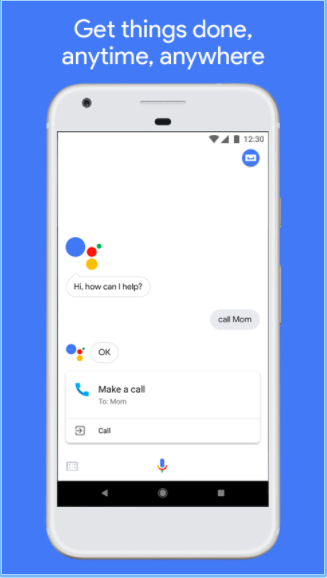 The Google Assistant was launched on the Google Pixel smartphones and Google home in 2016, before expanding to other Android devices. Junk photos taking up space in your phone? Siftr Magic is here for your rescue. 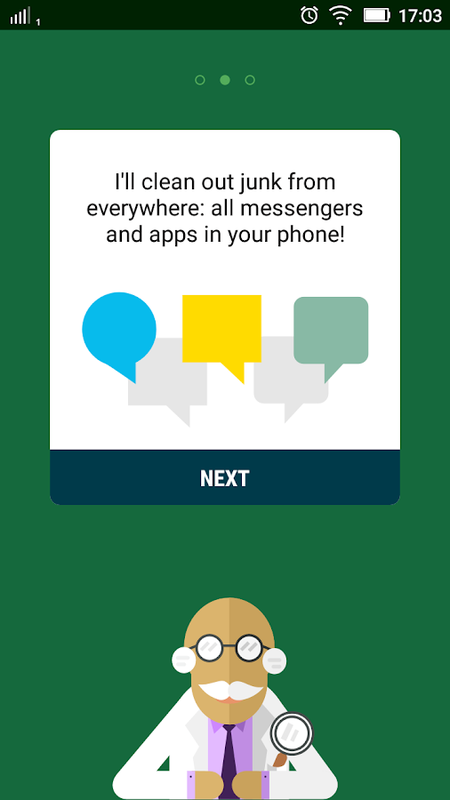 This popular artificial intelligence app detects junk photos on your phone to free up space in your phone. 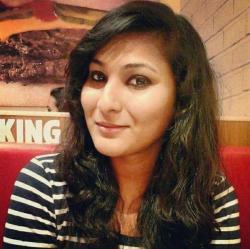 It scrutinises your pictures through a series of AI algorithms and delivers results instantly. You can also select photos manually for trash or allow Magic to do the job. The app is available for free on iOS. Solving math equations will now become easy for you with this smart tutor app. Socratic can give answers to math homework and also explain how to solve it by taking a picture of the math problems. It uses artificial intelligence algorithms to analyze the homework problem and then returns explanations along with videos to give step-by-step help. The company claims that Socratic’s AI combines cutting-edge computer vision technologies, which read questions from images, with machine learning classifiers built using millions of sample homework questions, to accurately predict which concepts will help you solve your question. Not just math problems, Socratic can help you with Biology, Algebra, Chemistry, English Grammar, History, Economics and more. 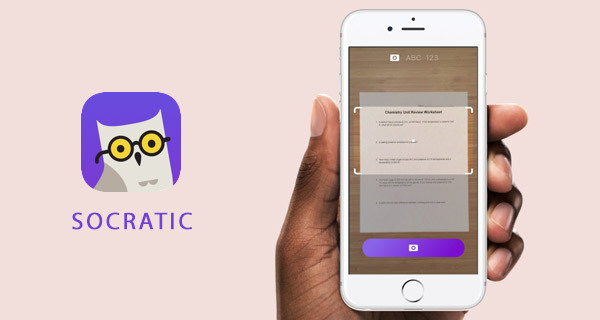 Socratic is a free app that is available only on iOS. 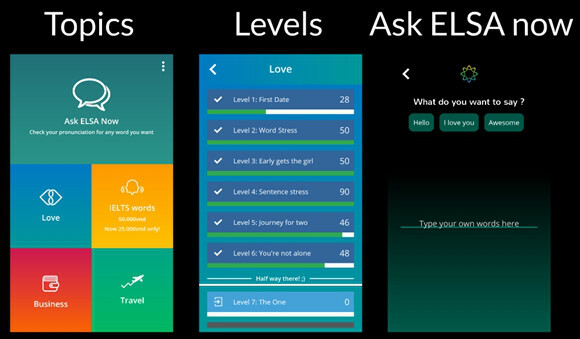 English Learning Speech Assistant is a mobile app that will help you be the master of English language, without spending a hefty amount. The world’s smartest AI pronunciation tutor helps you speak over 2,000 popular English words with perfect pronunciation. It gives a different curriculum options that can be accessed based on interests. And if it detects a mispronunciation, it gives you a feedback on how to move your tongue and lips to correct your words. You can also track your progress and come back to practice any words you’re still stuck on. Elsa is free of cost and is available on both iOS and Android. Robin is a voice-based personal assistant app for Android users. It comes handy especially when you are lost somewhere and you need more accurate navigation or want to know the traffic status, weather forecast. Like Google Assistant and Siri, you can even call the person by calling the name of the person. You can also text hands-free with your voice and also responds to your gestures. It also helps with reminders, alerts, meetings, news etc. 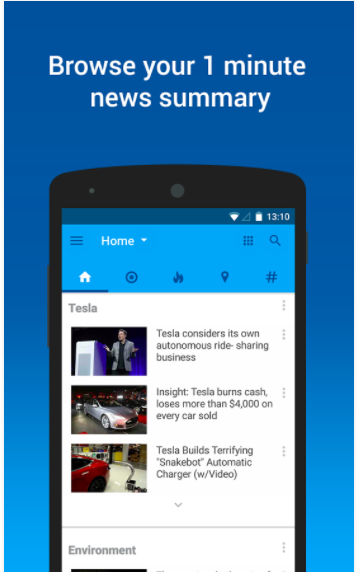 It is a smart news aggregation app which is powered by AI algorithms that provides you customized news by studying your reading habits. It will keep you updated on latest news, articles. Recent also suggest relevant articles and propose topics you might like to follow. Recent News app lets you sync your account with multiple devices, so you can bookmark articles on your phone and browse them later on other smart devices. The good thing is when you are not using the app, it preserves your battery by doing no background activity and includes a battery saver option for less energy usage. 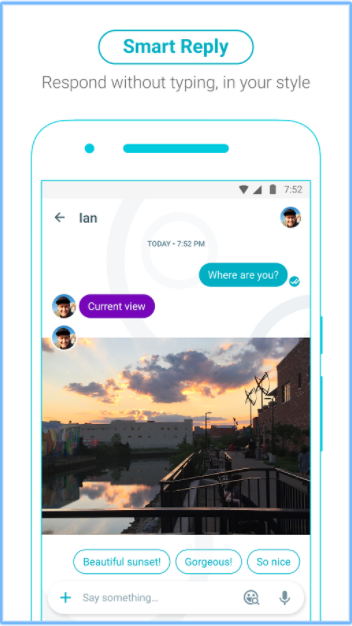 This AI-powered messaging app is similar to many other messaging apps but it can perform a wide variety of tasks like answering the question, add events to the calendar, find videos and more. You can also respond to messages without typing a single word. The Smart Reply feature learns your behaviour and suggests responses to text and photos, in your style. The app also has a image recognition feature, you can also get creative with photos by doodling them. Moreover, Allo helps you find restaurants nearby, share videos to watch and get answers, right in your conversation with your friends. You can also send messages with end-to-end encryption, use private notification to help keep your chat more discreet and control how long your message stick around with expiring chats. Allo is available on both iOS and Android. Hound is similar to Google Voice Search but instead of talking like a search query “Ok Hound.. Find Chinese restaurant,” you can just search using your natural voice like “Ok Hound… What are the top-rated Chinese restaurant near me? 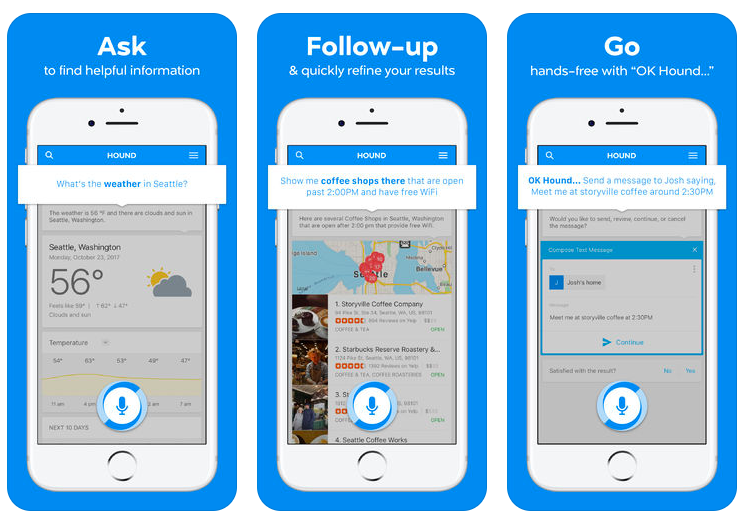 Hound can also use follow-up questions and commands to filter or add more information to your original request. Unlike other voice assistant, this app reportedly combines Speech Recognition and Natural Language Understanding into a single step and runs on Houndify platform. This unique AI app is not just limited to finding a coffee shop or a restaurant nearby, it also comes in wide range of features such as you can listen to your favourite song or video playback curated in the SoundHound playlist. You can also simultaneously set multiple alarms and set the timer accordingly. Similarly, you can also use it to know the weather forecast, not only that, you can also use this app to book an Uber ride, find movie show time, search hotels and plan your travels or search web for any information. Want to click better photos without making an extra effort? Just Point. Shoot. Perfect. It captures 10 frames with each shutter click and uses AI to pick up to three best shots and deletes the rest. It has serious intelligence behind the lens, so it’s like having a photographer inside your camera. It has a smart settings that automatically checks scene and lighting between each shutter tap and updates setting between each shot. You can also create a short, looping video, by stitching together the frames from the burst into a Live image, but it happens only when it senses motion in your shot so that it doesn’t waste the phone memory. 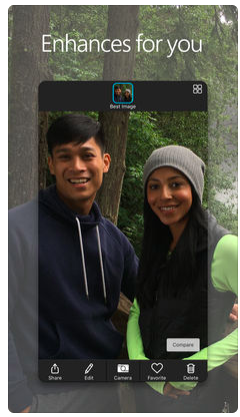 Pix optimises capture settings automatically when it detects a face in the shot to help people look their best. Pix is accessible only on iPhone and iPad.